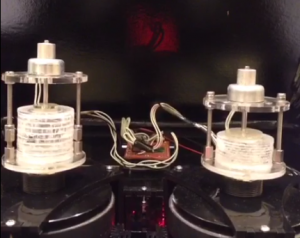 Since 2003, Troy Rogers has been hard at work developing a band of robotic musical instruments. 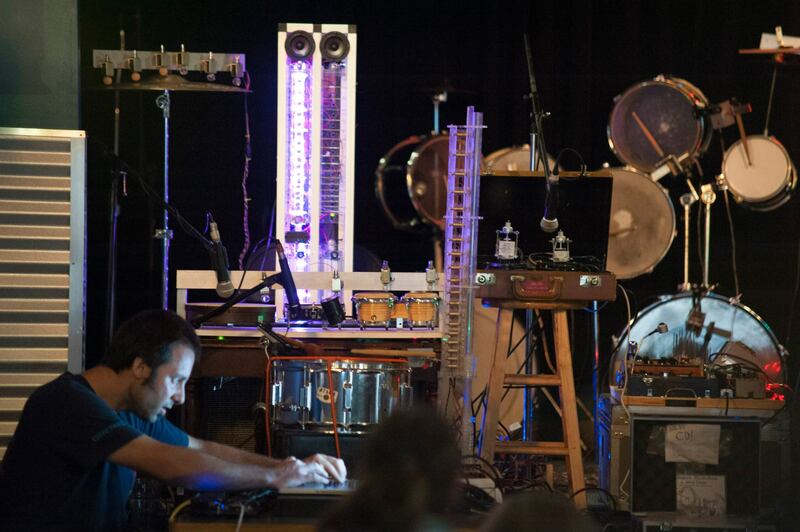 The project began with his first automatic instrument, a drumming robot called PercusBot, created during his studies at the University of Oregon. PercusBot made its way east to Charlottesville, Virginia in 2005 as Rogers began his doctoral work at the University of Virginia. 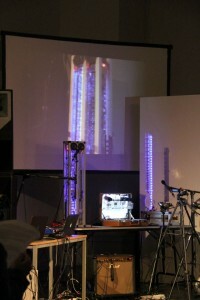 There, he met fellow pro-robotic composers Scott Barton and Steven Kemper with whom he founded Expressive Machines Musical Instruments (EMMI). 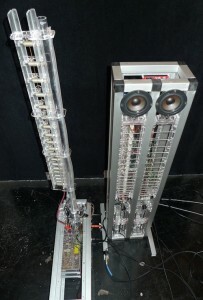 The trio developed an ensemble of musical robots together, beginning with the robotic string instrument Poly-tangent Automatic (multi-)Monochord (PAM) in 2007, followed shortly by Multi-mallet Automatic Drumming Instrument (MADI), a robotic snare drum, in 2008. For a time, EMMI’s robot band consisted solely of a snare drum and a single-stringed instrument. In 2009, Rogers traveled to Ghent, Belgium to work with master musical robot maker Godfried-Willem Raes at the Logos Foundation. Raes’ M&M Robot Ensemble is perhaps the world’s largest and most advanced robot orchestra, with 50+ instruments housed in a tetrahedral concert hall of Raes’ design. There, Rogers worked with the robots of the Logos M&M Ensemble while developing his vocal robot Stemmetje (Dutch for “the little voice”). He also collaborated with Dana Jessen and Michael Straus of the EAR Duo on an improvisational work for the duo and a sextet of Raes’ monophonic automatic wind instruments, which planted the seeds for the future development of Monochord-Aerophone Robotic Instrument Ensemble (MARIE). 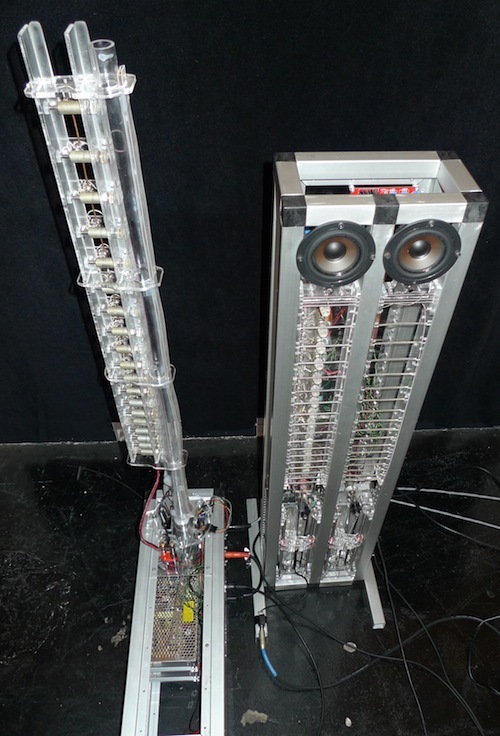 Meanwhile, back in Charlottesville, Kemper and Barton completed construction of Configurable Automatic Drumming Instrument (CADI) and wrote numerous pieces for the now trio of EMMI robots. In late 2010, EMMI and the EAR Duo began a fruitful collaboration. EMMI got to work designing a new ensemble of rugged, portable, versatile robots that would withstand the rigors of a set of planned tours across the US and Europe. 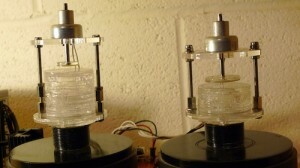 And composing a set of pieces for these new robotic instruments and the EAR Duo. A successful Kickstarter campaign provided the necessary funds to complete the two musical robots that together form MARIE. 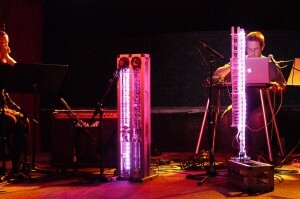 Cylindrical Aerophone Robotic Instrument (CARI) was assembled in time for a northeastern US tour, while Automatic Monochord Instrument (AMI) was finished during a residency at STEIM that kicked off EMMI and EAR Duo’s European tour. In the summer of 2012, EMMI’s percussion section was augmented by Transportable Automatic Percussion Instrument (TAPI), a diminutive assemblage of six automatically played percussion instruments housed in a vintage briefcase. MARIE and TAPI traveled to Copenhagen for the Sound and Music Computing Conference, where the instruments were showcased in the conference’s closing concert with a new set of compositions by each member of EMMI as well as a group of commissioned composers. 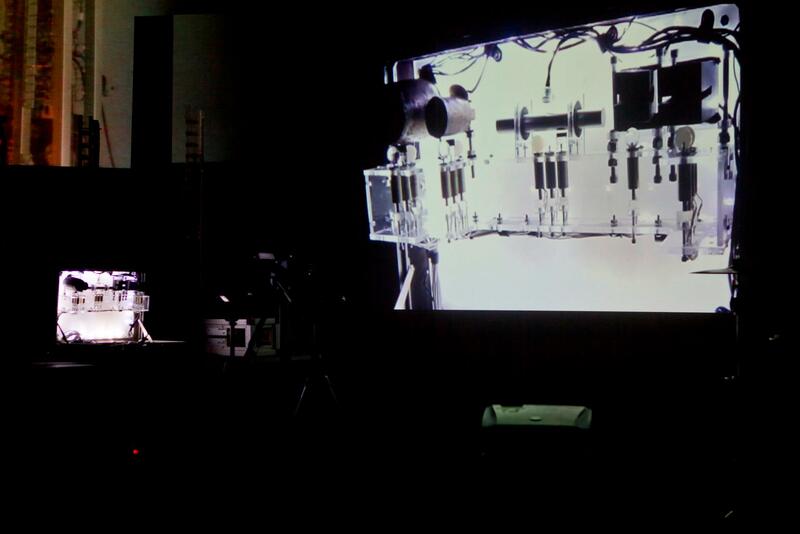 Throughout the rest of the year, EMMI presented a series of performances for this new robotic trio (AMI + CARI + TAPI). By 2014, EMMI’s members and robots had dispersed from Charlottesville to disparate points in the US. Barton had taken PAM and some of CADI to Worcester, MA, where he began teaching at Worcester Polytechnic Institute and formed the Music, Perception, and Robotics Lab. After a stint on the west coast in San Diego, Kemper brought TAPI and the remainder of CADI to Rutgers University where he now directs the music technology program at the Mason Gross School of the Arts. 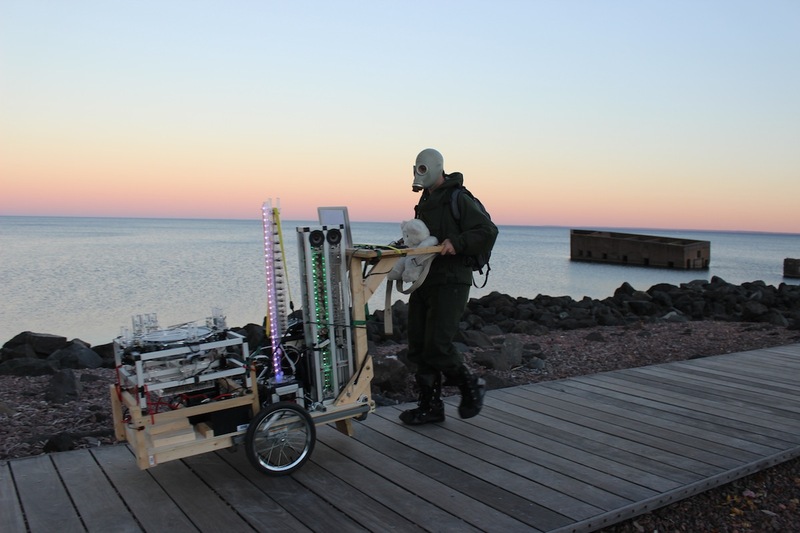 Rogers returned to his native state of Minnesota, and introduced AMI, CARI, and MADI to the beauty of Lake Superior, pushing them through the streets and pathways of Duluth in performances of Robot Rickshaw. Rogers developed a set of new pieces and arrangements of existing works for the quartet of AMI, CARI, MADI, and Stemmetje. 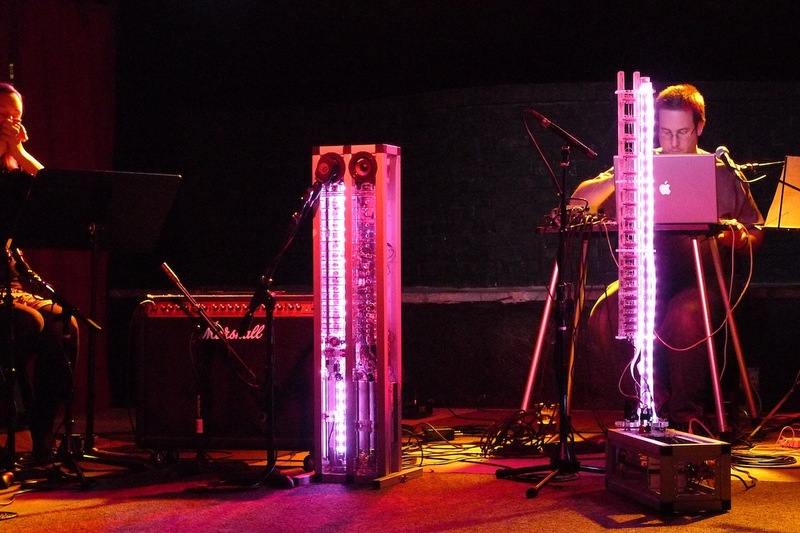 In 2015, Various Automatic Drumming Instruments (VADI), a group of robotic drums and ride cymbal were added to the mix, and Rogers and his band of robots piled into the RoboRig (a brightly-painted converted U-Haul box truck that now serves as a mobile studio, workshop, and touring rig) and set out across the US for a series of performances, lectures, and workshops. The tour coincided with the release of a new album of studio recordings made with AMI, CARI, MADI, Stemmetje, and human drummer Steve Snider, as well as the release of EMMI’s kits for rapid development of robotic percussion instruments, which were showcased at the Bay Area Maker Faire (where Robot Rickshaw received an Editor’s Choice award), the New Interfaces for Musical Expression (NIME) conference at LSU in Baton Rouge, LA, the Experimental Garage Sale in Chicago, and a multitude of stops along the way. After the tour, Rogers returned to MN to conduct a series of workshops in making music with robots geared toward high school students, and to expand the robot band with new instruments and begin composition of a new set of pieces for an upcoming album of music for robots slated to be recorded by esteemed producer Steve Albini at Electrical Audio in mid-2016.